- A motion picture version was in development at Warner Bros. in 2003, with Robert Schwartz and Stephen Storer producing, as a vehicle for Laurence Fishburne, although Coelho has stated on his website that he has tried to buy back the rights to the film for the sum of $5 million. 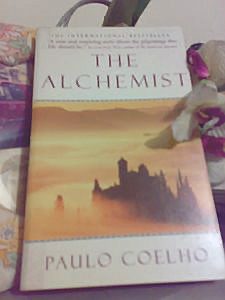 - Paulo Coelho said, "When I wrote The Alchemist, I was trying to understand the reason for the existence of life. Instead of writing a philosophical treatise, I decided to converse with the child inside my soul." I first heard of Paulo Coelho from my friends and my cousin who really loved to read the author's books. They told me that The Alchemist, his first book, was a great read, for it almost tackled universal ideas that many readers could easily relate with. The ideas and concepts presented in his works are mostly agreeable that you might think you are one with Paulo Coelho in purpose, ideals and beliefs. Despite this work being a little too lyrical and sprinkled by a lot of symbolism you will certainly get straight to the point that the story urges everyone who reads it to fulfill their own dreams at their own pace and time. "To realize one's destiny is a person's only real obligation. All things are one. And, when you want something, all the universe conspires in helping you to achieve it." This was the start of my Paulo Coelho addiction. The mere fact that I will miss any of his books simply depresses me. I dearly wish that I haven't skipped my Latin and Spanish lessons, because the regret is too great every time he releases a new book in Latin America and the English readers will have to wait for a couple more months. That is quite unfair. The Alchemist is so well loved -- and so well criticized -- that it has been translated into 56 languages, and has sold more than 65 million copies in more than 150 countries, and is one of the best selling books in history.